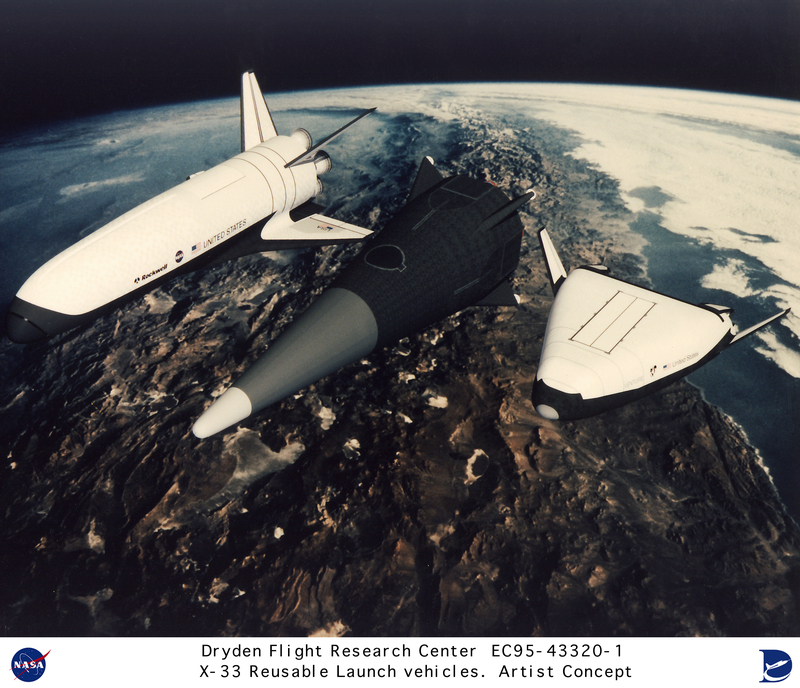 Description: This artist's rendering depicts the three designs submitted for the X-33 proposal for a technology demonstrator of a Single-Stage-To-Orbit (SSTO) Reusable Launch Vehicle (RLV). NASA considered design submissions from Rockwell, Lockheed Martin, and McDonnell Douglas. NASA selected Lockheed Martin's design on 2 July 1996. The RLV technology program was a cooperative agreement between NASA and industry. The goal of the RLV technology program was to enable significant reductions in the cost of access to space and to promote the creation and delivery of new space services and other activities that would improve U.S. economic competitiveness. Description: The X-33 is a wedged-shaped subscale technology demonstrator prototype of a potential future Reusable Launch Vehicle (RLV) that Lockheed Martin has dubbed VentureStar. The company hopes to develop VentureStar early this century. Through demonstration flight and ground research, NASA’s X-33 program will provide the information needed for industry representatives such as Lockheed Martin to decide whether to proceed with the development of a full-scale, commercial RLV program. The X-33 was a wedged-shaped subscale technology demonstrator prototype of a potential future Reusable Launch Vehicle (RLV) that Lockheed Martin had dubbed VentureStar. The company hoped to develop VentureStar early this century. Through demonstration flight and ground research, NASA's X-33 program was to have provided the information needed for industry representatives such as Lockheed Martin to decide whether to proceed with the development of a full-scale, commercial RLV program. The X-33 design was based on a lifting body shape with two revolutionary "linear aerospike" rocket engines and a rugged metallic thermal protection system. The vehicle was also to use lightweight components and fuel tanks built to conform to the vehicle's outer shape. Time between X-33 flights was planned to be seven days, but the program hoped to demonstrate a two-day turnaround between flights during the flight-test phase of the program. The X-33 was an unpiloted vehicle that took off vertically like a rocket and landed horizontally like an airplane. It was to have reached altitudes of up to 50 miles and high hypersonic speeds. The X-33 program was managed by the Marshall Space Flight Center and will be launched at a special launch site on Edwards Air Force Base. The program was cancelled in February 2001, due to problems with the vehicle's composite liquid hydrogen tank.